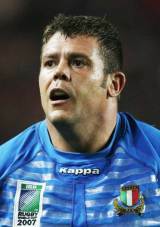 Prop Andrea Lo Cicero has established himself as one of the most important members of the Italy squad since his debut against England in 2000. A powerful presence both at scrum-time and in the loose he has been an ever present through Italy's Six Nations journey. He has since gone on to rack up over 80 caps for Italy whilst playing his club rugby for Metro-Racing Paris alongside international team-mate Carlo Festuccia. Lo Cicero scored a try on his debut for the Barbarians against New Zealand in 2004. Lo Cicero will go to the 2011 World Cup as part of Nick Mallett's 30-man squad.